One of the most fascinating things about kimchi is how no other food on Earth has as much of a beloved following by its people. Russia is linked to its love for vodka, Germans spread their love of beer throughout the world in the late 1800s but the obsession of Korea with kimchi goes even deeper. After millions of dollars and years of research, South Korean scientists successfully developed kimchi to be brought to space by their first astronaut in 2008. Koreans like to say that where they go, kimchi goes too. 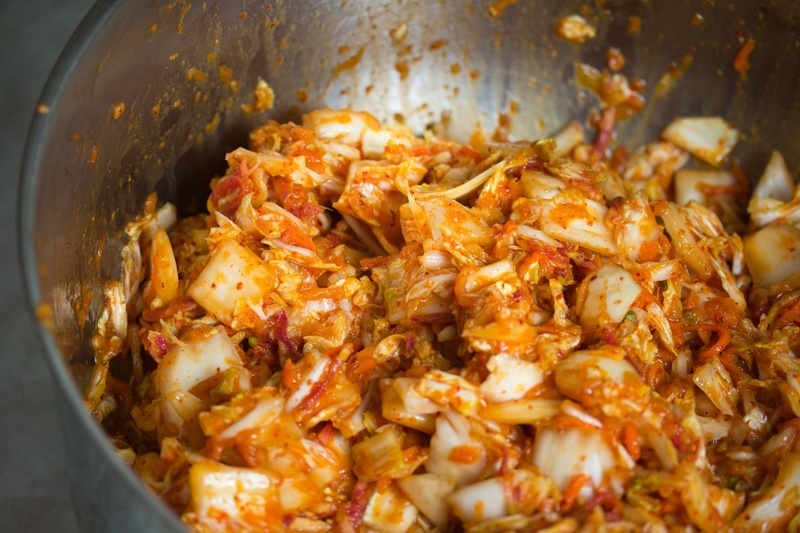 What makes kimchi so irresistible? To me, it’s because it assails the senses with so many layers of texture and flavor. You have the crunch of the napa cabbage, the bright tang of the acid produced by wild fermentation, the garlic, ginger and the way the fruity pepper flakes cling to it all, making every bite pack a punch. I used to have a ritual of always hoarding homemade sauerkraut in my refrigerator but after making kimchi on a whim, I decided that, like the South Korean astronauts, I’m always going to have it on hand so it goes where I go too. 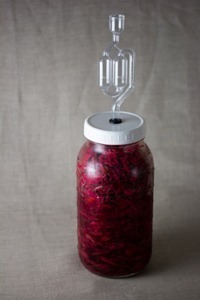 I go into more detail about fermenting vegetables in my How to Make Sauerkraut article. 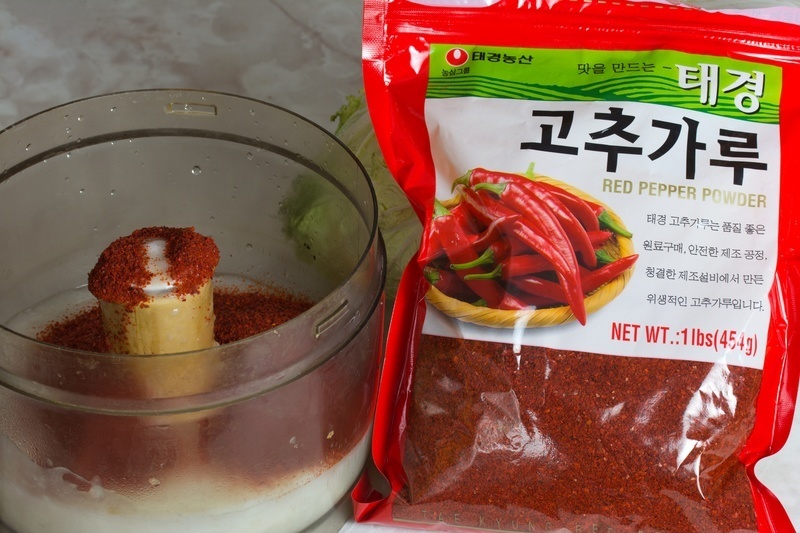 The hardest part about making kimchi is finding the main spice, kochukaru, which is Korean dried hot pepper flakes. These peppers feature a flavor that’s moderately spicy, bright and relatively fruity. If you really want the signature irresistible spicy tang of kimchi, I suggest you track it down. It can be found at most Korean supermarkets such as HMart in the US, other markets specializing in Asian food or it can also be found online. If you can’t find it, substituting Aleppo pepper flakes comes pretty close. You may also get decent results by using a mixture of half ancho and half guajillo pepper flakes. Whatever you do, don’t use cayenne because it’s way too spicy. One of the reasons I’m a sauerkraut-to-kimchi convert is due to how brilliant the preparation method is. Kimchi utilizes a rice starch that’s gelatinized and mixed into a purée. Then ingredients such as kochukaru, soy sauce, scallions, garlic, ginger and salt are mixed into this purée so it sticks to everything and is consistently distributed throughout the condiment. This ensures that every bite has consistent flavor and the texture is both soft and crunchy. Using what I call the kimchi methodology, you can create many other fermented condiments utilizing regional vegetables and spices instead of Korean ones, while using the same steps you would use to make traditional Korean kimchi. For example, I recently made what I jokingly refer to as Moroccan Kimchi, featuring Ras El Hanout instead of kochukaru, and replaced some of the vegetables with cucumbers, eggplant, figs, dates and pomegranate juice, while using millet instead of rice flour for the starch component. The possibilities are endless. Speaking of possibilities, there are many traditional ways to make classic Korean kimchi too. I don’t insist that this recipe is the one true version but I feel that it’s a good representation of classic Korean kimchi with an obviously vegan slant. This particular version doesn’t call for fish sauce, anchovies or shrimp which is often used in kimchi. I make up for it with soy sauce and a couple other tricks I have up my sleeve. More on that later. In order to encourage our specific microbes to take residence in our vegetables and leave their flavorful mark, we need to create the proper environment for them to thrive in. A salt concentration between 2 to 3% is the way to do this for the microbes. So how do you take a bucket of vegetables and figure out how to ferment them in a 2 to 3% salt solution? It's easier than you think. I say roughly calculating the salt concentration because in kimchi, we're also adding soy sauce (or traditionally, fish sauce) which has a varying amounts of salt concentration depending on the style and brand; it's impossible to calculate an exact salt concentration with soy sauce or fish sauce being part of the variable. This is why I recommend roughly calculating to 2% salt concentration. The soy sauce and kombu powder, if using, is not inlcuded in our calculation so adding it later, as called for in the recipe, will bring salt concentration up a percentage or two. Don't worry, we'll still be in the range for getting a proper fermentation with optimum flavor. For a 2% salt concentration, add 2 grams of salt to every 100 grams of vegetables. In other words, for a 2% salt concentration, add 20 grams of salt per 1 kg (1000 grams) of vegetables. Note that all of the vegetables are weighed before being divided up for the various recipe steps. Keeping this rule in mind, all we need to do is scale up the rule to fit our measurement of our vegetables. So if we have 1.9 kg of vegetables it's also 1900 grams. Here’s the takeaway: Just weigh your vegetables in grams and multiply it by .02 to find the amount of salt you need to add in grams to make a 2% salt concentration. If you make kimchi or sauerkraut even semi-regularly, I highly recommend investing in a suitable crock that includes weights and a suitable airlock. I prefer Nik Schmitt brand crocks for this purpose because they’re affordable and they feature an airlock consisting of a groove around the rim that allows it to be filled with water to be air tight (the image below is a Harsch brand crock, which unfortunately are no longer being produced). For years I improvised with various jars, buckets and cheesecloth and had no idea what I was missing until I finally broke down and bought one of these. Dedicated crocks are recommended because fermented vegetables need to be weighted down sufficiently so they release some of their water. Having the whole operation airlocked will keep your home from smelling like fermenting food which will keep your significant other significantly happier, believe me. An airlock will also keep suspicious sludge from growing on the surface of your ferment. Yes, I said, suspicious sludge from growing on your ferment. When oxygen gets exposed to your fermenting vegetables, it brings with it other microbes that aren’t welcome. In non-airlocked crocks, this sludge is just picked off and discarded after fermentation is complete. Airlocked crocks prevent this from happening as long as you keep the lid on for the duration of the fermentation, save for a couple peeks. This is because as the vegetables ferment, C02 is released. In an airlocked crock, this C02 sits on top of the vegetables, forming a protective layer. Since the microbes that cause the sludge are aerobic microbes (oxygen loving), using an airlocked crock prevents them from taking up residence on your vegetables. If you’re not ready to invest in a crock yet, you can improvise by locating a clean, food-grade plastic bucket, filling a jar that has a slightly smaller diameter than the bucket with water, sealing it and placing it on top of the vegetables. Don't forget to make sure the entire exterior of this jar has been throughly cleaned so you're not introducing bad guys to your vegetables. Covering the bucket with cheesecloth and securing it with a rubber band keeps insects out. Keep in mind that you’ll need to pick off the top layer of sludge and discard it when fermentation is complete. Lower temperatures down to 55F (13C) will increase fermentation times but result in a more complex acid profile and longer shelf life. Higher temperatures up to 90F (32C) will result in reduced fermentation times, sharper, more aggressive acid profiles and shorter overall shelf life. This is because different temperatures favor different microbes and the microbes release varying amounts of flavor compounds at different temperatures. Room temperature is advised. During hot New York City summers where my home gets into the mid 90s, I ferment in a homemade dedicated temperature controlled refrigeration chamber set to 68F (20C) because I’m crazy like that. 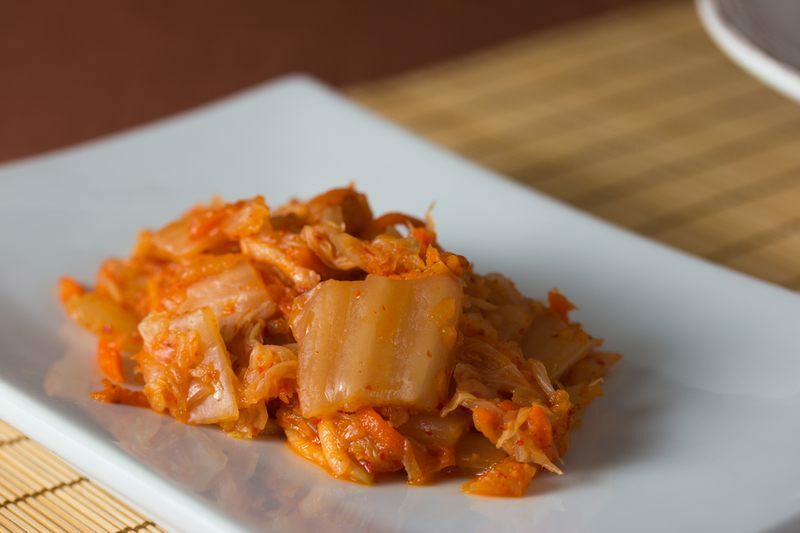 Most traditional kimchi calls for non-vegan ingredients like fish sauce, shrimp and even anchovies. This is to provide savory umami notes that meld particularly well with kimchi's salty, tart and garlic flavors. When making a vegan version, you can just omit these ingredients and still make an amazing kimchi. If you prefer to keep umami intact, you can achieve a suitable savoriness by grinding shiitake mushrooms into powder with a spice grinder then doing the same with dried kombu seaweed. Both dried shiitake mushrooms and kombu is available at Japanese grocery stores. 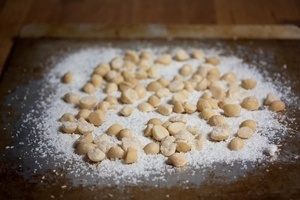 Dried shiitake mushrooms are particularly rich in the umami flavor compound monosodium glutamate but when they're dried, the umami compound guanylate increases, making them even more savory. Kombu contains the densest known plant-derived source monosodium glutamate. Both monosodium glutamate and guanylate have a synergistic effect when combined and become more complex and more powerful than the sum of their parts. These are some of the same flavor compounds that are available in fish sauce, shrimp and anchovies. To grind these ingredients into powder, I first take my coffee grinder and grind a couple small batches of rice or corn flour to clear out any coffee grinds and traces of coffee flavor. I then proceed to grinding the dried mushrooms, transfer the powder to a separate container for future use and proceed the same way with the kombu. You'll find these magic powders to be a great secret ingredient if you enjoy savory flavors in your cooking, especially if you cook vegan food often. They both have a permanent residence in my spice cabinet. After I'm done grinding, I do a couple more grinds of rice or corn flour so my next coffee grinding won't yield savory coffee. Although that could be interesting! Many people unfortunately believe that monosodium glutamate is unhealthy. I used to feel this way too until I looked at it with a closer eye. The truth is that it's frequently found in naturally savory foods such as tomatoes, miso, soy sauce and even green tea. There's an extremely good chance that it was present in its natural form in some of the unprocessed foods that made up your lunch. It's important to note that everything is toxic in abnormally large amounts. If you disagree with the use of monosodium glutamate and other umami enhancing ingredients in your food, I encourage you to leave them out. To learn more about the nutritional benefits of kimchi or how to improvise your own crock, check out my article on How to Make Sauerkraut. 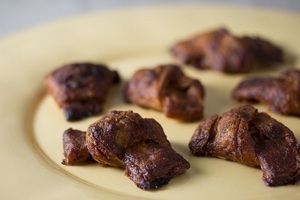 You can also use your vegan kimchi in Kimchi Vegan Butter and Kimchi Puff Pastry with Shiitake Mushrooms and Pine Nuts. In a food processor with the shredding attachment, shred the daikon, carrots and apple. Alternatively, you can use a mandoline or cheese grater for shredding. Transfer the vegetables and fruit to a medium bowl and set aside. In a small saucepan, add the water, white rice flour and bring the mixture to a boil. Remove from heat and transfer to a food processor. Fit your food processor with the blade attachment. Add the kochukaru, soy sauce, scallions, garlic, ginger, shiitake mushroom powder, salt, kombu powder (if using) and process until smooth. 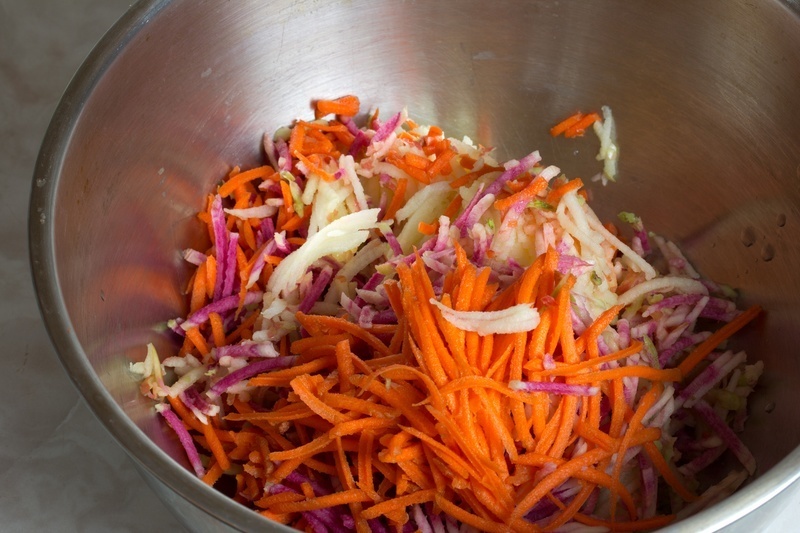 Transfer the mixture to the bowl containing the shredded vegetables from Step 1 and stir to combine. 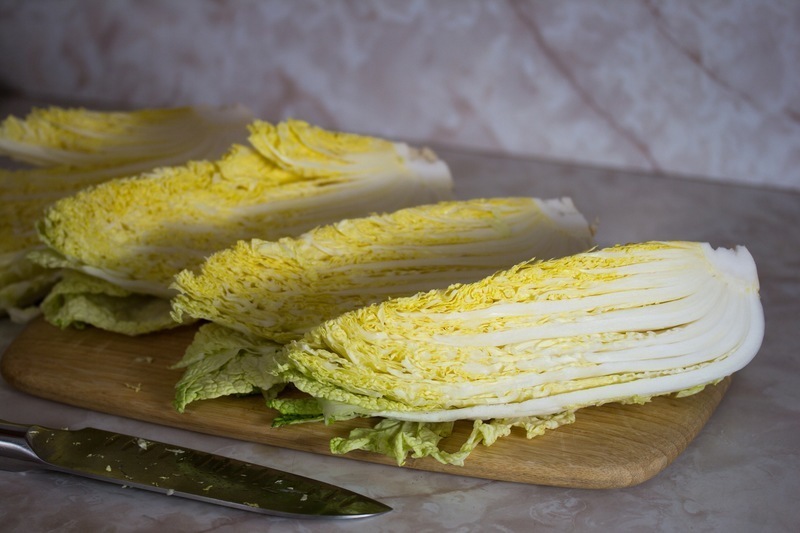 Remove the outer leaves from the cabbage and discard them. Cut the cabbage in half lengthwise. Now cut those halves into quarters. Carefully slice the quarters into strips about 1 inch wide, lengthwise. Cut out the core on each slice then cut each strip into 1 inch wide squares. The goal is to cut the cabbage into roughly 1 inch squares. 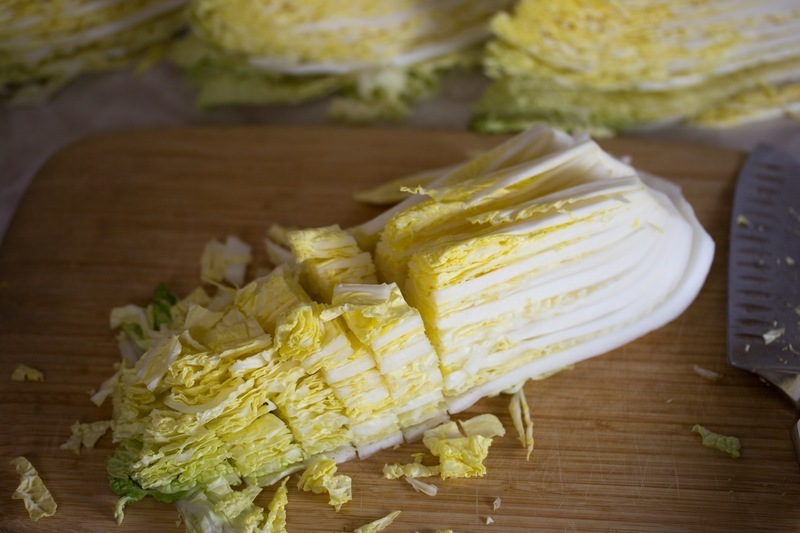 If you prefer your kimchi to have larger strips, slice the cabbage accordingly. Place the leaves into a large mixing bowl and add the spiced vegetable mixture. 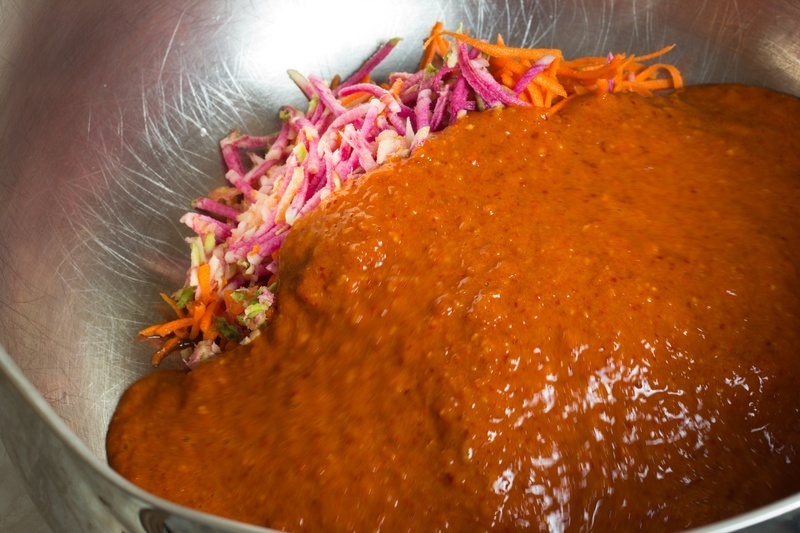 Using both hands, grab handfuls of the kimchi mixture and squeeze as if you’re kneading bread. This breaks down the vegetables and releases liquid so it can more easily be fermented. Work your way around the mixing bowl for about 5 minutes. There should be liquid starting to appear in the bottom of the bowl. Transfer the kimchi to a clean crock, weigh it down with the clean weights and seal with a clean suitable airlock or lid. If you don’t have a crock you can use a large clean bowl or bucket, place a weight on top consisting of a clean jar filled with water and cover the top of the bowl or bucket with cheesecloth secured with a rubber band. Ferment at room temperature (about 68F or 20C) from 3 days to 2 weeks, depending on the acidity and tartness desired. Transfer the kimchi to a large covered container in the refrigerator where it will last up to a year or perhaps even longer. Makes about 10 pounds (4.5 kg) vegan kimchi. Thanks so much for the idea of using mushrooms and kelp in the place of fish sauce. 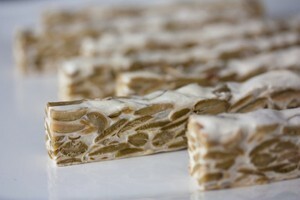 After making a few batches, we have a question, why do you recommend dried mushrooms and kelp? Can fresh ones be cut up and used? Other than the higher concentration of monosodium glutamate is there a reason that dried is better? Thanks! That's funny. I was thinking I may have had a kimchi fairy also!! ;) I want my kimchi hotter. How much more of the red pepper would you add? Hello I wrote to you recently pre kimchi :) it is finished and very delish. Even better after sitting in fridge for a week. My question is, at around day 13 the kitchen began to smell of kimchi. Checked water seal on crock and all good. On day 15 I went to open crock and the water seal was overflowing with water. No mold in pot and as I said kimchi tastes good. Ever hear of this happening? That's odd that your kitchen began to smell of kimchi and the water in the airlock was sufficient. Theoretically the small amount of carbon dioxide bubbling up through the airlock isn't enough to contribute kimchi smells to the surrounding area. It's also odd that your airlock was overflowing with water the following day. The airlock shouldn't be able to be accessed by the kimchi fermenting, unless it becomes sentient and develops ulterior motives. It seems almost as if you have a kimchi fairy that may have checked on it and filled up the airlock with water when you were gone! Thanks for the crock information Hari! The Harsch Crocks (pictured in this article) have been continued and the company resources have been acquired by Nik Schmitt I believe. This is a shame because although the Nik Schmitt and other pots have great water seals, the Harsch was had the best design on the market due to their water seal being deeper. This means that you don't have to top up the water in the seal as often due to evaporation. The next time I need to buy a crock I'll be buying a Nik Schmitt. 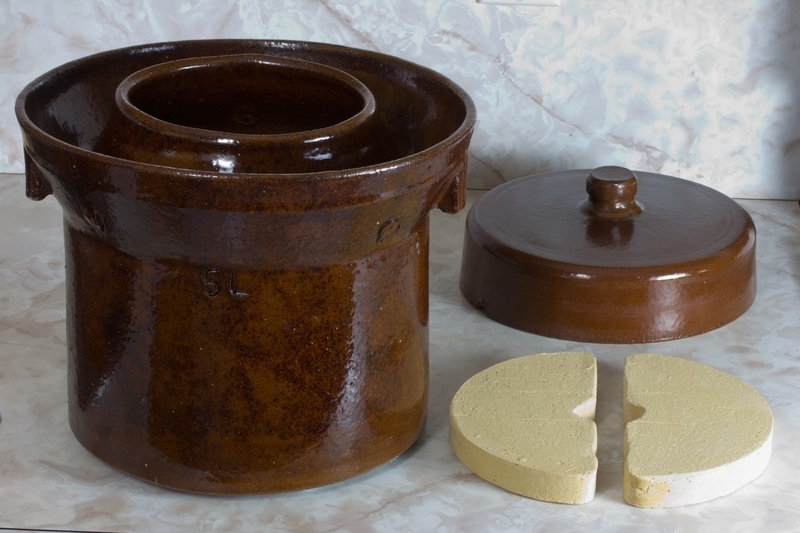 I recently just purchased a stoneware crock from Ohio Stoneware for miso making. They don't have a water seal but the craftsmanship and ceramic quality is second-to-none. Hello, In the recipe you say let ferment for one to five days but another person asked and you said two weeks? Which is est? I just purchased a fermenting pot, I'm new to this's. thanks! Great question Adrienne! Thanks for allowing me to realize that I need to be more clear on this. I just updated the recipe to call for fermenting the kimchi from 3 days to 2 weeks depending on the level of acidity you prefer. 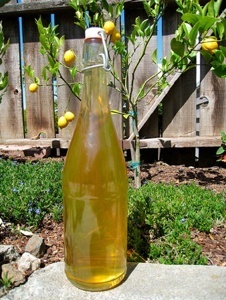 During the last batch I made I fermented it for 3 weeks to test the upper limits of the acidity. Don't do that! My wife won't let me eat it in the house and it's extremely tart, even for my tart-loving palate. 10 days at room temperature is what I prefer because it allows the kimchi to develop just enough tart and funk that compliments the other flavors in my opinion. Good luck with your kimchi adventures! This is a great recipe. I go a little heavier on the kochukaru and I add a little fish sauce to it too. It'a an acquired taste, but this is a wonderful recipe. I am getting ready to make another batch up right now in the crock. I use the same style crock and let it ferment for about a week. I put it in jars and it lasts a while in the fridge. Glad you like the kimchi Derek! I went a little heavier on the kochukaru last time and it was perfect for me. I like things super spicy though so I try to go a little easy on what's called for in my recipes so I don't burn people too bad! The fish sauce is traditional and really lends a needed savory layer that works well with the other flavors. I'm working on a blend of shiitake mushroom/kombu powder to add a substantial savory layer so the fish sauced won't be missed. I'll update the recipe as soon as it's ready to go. Great question Pat! 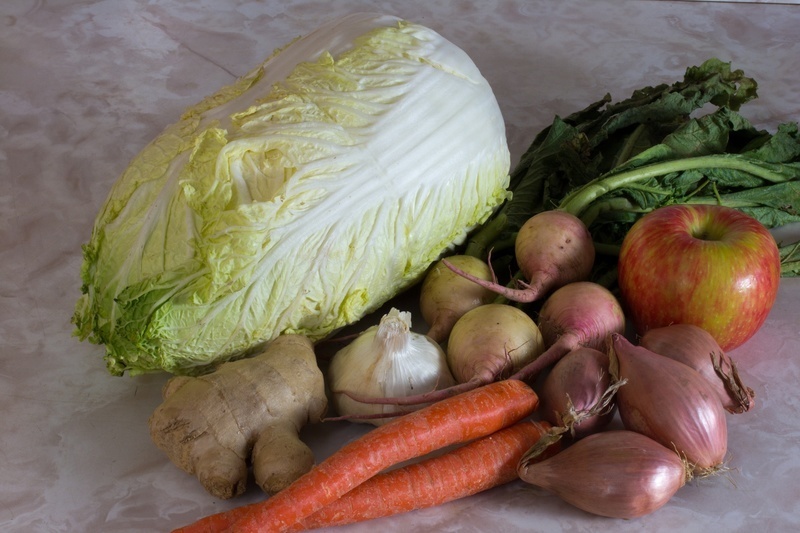 Kimchi/sauerkraut and other wild fermented vegetables do continue to ferment when stored at refrigerator temperature; they just ferment slower. 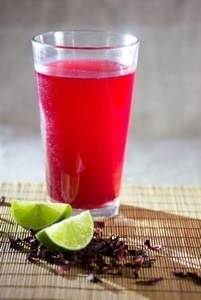 Think of the refrigerator as nothing but a sophisticated "fermentation slowing device". The kimchi will definitely get more tangy over the period of a year. Some people may find the tangyness to be too much. Personally, I love super tangy, funky fermented foods. But it's perfectly ok if you don't prefer it. In this case, I'd recommend making smaller batches so you can get through it in weeks instead of months. Good luck! I am getting a crock just for this! how long with a proper crock and a cool basement environment would you suggest letting this ferment for? Do you feel 10 weeks may be too long? Hi Jeff, It depends how cool your basement is and how much acidity you prefer. In 60 degree temps I imagine it would be in the neighborhood of three to six weeks and possibly longer. I'd check it after two weeks for sure. Try to check it only when absolutely necessary; the more you remove the airlock, the more the mildew-causing microbes get in and cause mildew on the surface that you'll need to discard later. Good luck! mannny thanks to your work and your sharing. Great recipes, they are very very helpful! So glad you like my recipes Jessiewee!